How very “Coney Island”: pay for baby’s medical treatment by turning it into a tourist attraction. “Baby incubators” which manufacture ideal conditions of heat, moisture, and atmosphere, save the lives of thousands of prematurely born infants every year who otherwise could not survive. 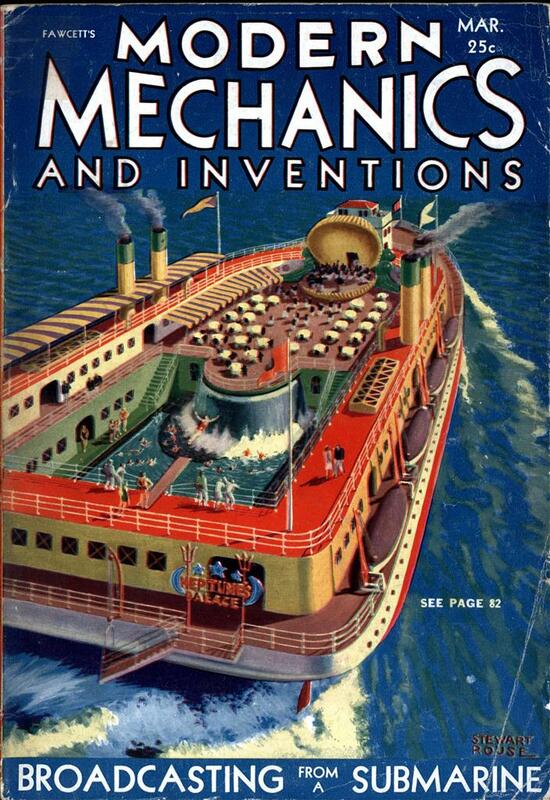 MAN-MADE machines have again triumphed over the seemingly unconquerable forces of Nature with the invention of the mechanical mother. 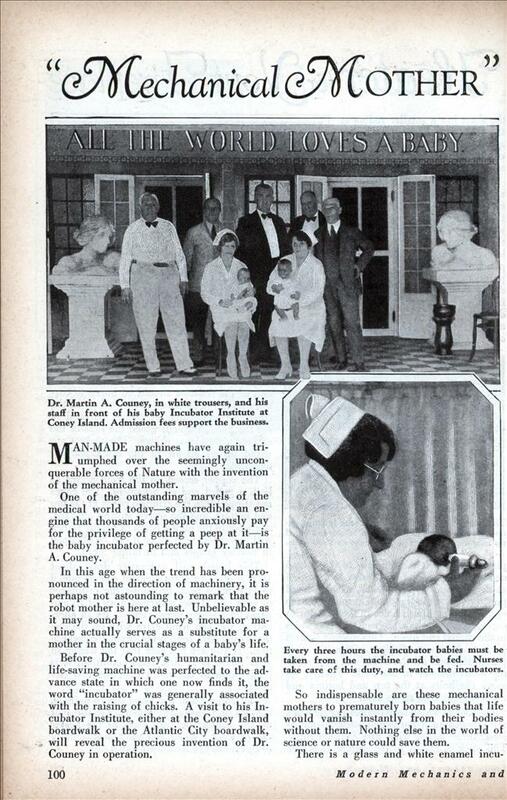 One of the outstanding marvels of the medical world today—so incredible an engine that thousands of people anxiously pay for the privilege of getting a peep at it—is the baby incubator perfected by Dr. Martin A. Couney. In this age when the trend has been pronounced in the direction of machinery, it is perhaps not astounding to remark that the robot mother is here at last. Unbelievable as it may sound, Dr. Couney’s incubator machine actually serves as a substitute for a mother in the crucial stages of a baby’s life. Before Dr. Couney’s humanitarian and life-saving machine was perfected to the advance state in which one now finds it, the word “incubator” was generally associated with the raising of chicks. A visit to his Incubator Institute, either at the Coney Island boardwalk or the Atlantic City boardwalk, will reveal the precious invention of Dr. Couney in operation. So indispensable are these mechanical mothers to prematurely born babies that life would vanish instantly from their bodies without them. Nothing else in the world of science or nature could save them. There is a glass and white enamel incu- bator, resembling very much a showcase lodged on a base, in which you will see prematurely born babies, mere specks of humanity, whose life-blood will come to them from the machine in which they are scientifically nestled. At first you will feel a weirdness sweep over you. You cannot believe that there is life in the wee slip of a body which lies bundled in a space not larger than your opened hand, weighing hardly two pounds sometimes. But if the infant is not asleep, you will see its skin twitch, its eyes roll, or it may even cry for you. It is there, in the flesh, breathing and living. Although it may not be commonly known, a great many cases occur of babies prematurely born. The causes are numerous, but chiefly this occurs when the mother suffers some shock, accident or illness. The prematurely born babies have been brought to Dr. Couney from hospitals and physicians. He has been an authority on the premature child for thirty-two years, and that is how long his salvation work with incubators has been going on. During that time he has handled 6,000 babies. Among these were fourteen sets of triplets and 300 sets of twins. The lives of 85 per cent have been saved. There is little hope of preserving the lives of babies born at the end of six months, although there are isolated cases of its having been done. Usually the child must be at least seven months old before its life can be prolonged. “The three great factors which figure in the very early life of an infant,” said Dr. Couney, “are protection, heat and air. It was these qualities which my machine-mother had to reproduce to supplant the child’s mother. “Now I will explain to you how my incubator works as a mechanical mother. In my apparatus the heat is supplied from an 18-in. boiler, heated by gas, and having thermostatic regulation. That is, I maintain a temperature of from 80 to 95 degrees in the incubators, and that is regulated by the thermostatic device whose function I will further explain later. “Now for the air. First of all let me say that nearly all children are born in a state of atelectisis, in which the lungs are in a .
condition of air emptiness. Ordinary air is too strong for them, consequently I must use artificial means. “The air is obtained from the outside through a 3-inch pipe. This pipe rises 60 feet above the dust level and is drawn in by a motor. Close to each incubator, set in the air-tube about a foot from the incubator, is an anemoscope, a perforated disc which revolves to show that the air is passing through. It whirls around like a pinwheel. “This air passes over a moist solution, to give it its necessary moisture, and then proceeds through the tube and through a triple cotton filter. As it enters the base of the incubator it passes over the pipes which are heated from the gas boiler. It is next diluted with oxygen and is passed up through a tube and a funnel placed near the baby. It is a strange force which compels the baby to keep its face in this funnel and breathe out of it. “As for protection, the incubators are hermetically sealed. Within the parallelpepedon case there is an exhaust pipe which rises eighteen inches to prevent any explosion from the boiler. Then there is another tube which projects from the top of the incubator out of which emerges any impure air or other gases. This is forced out by a whirling-wheel propelled by the outflow of the gases, since gases naturally rise. “There you have a description of the incubator. But one of these machines alone would never save a child. One must know how to care for such an infant. They are taken out of the incubators every three hours, covered in towels, taken into the nursery where they are changed and fed. They must be fed on mother’s milk in order to survive. Science has not succeeded in replacing the mother here. “This machine as you view it today has required thirty-five years of my life to complete. When I first became interested in pediatrics, I was an interne in the Hospital of L’Enfant Jesus in Paris. In those days an incubator was regarded as a toy, something with which to experiment. It was more of an object of curiosity. Dr. Couney explains that he became so enthusiastic about finding a method for saving the lives of these unfortunates that he ignored the stringent hospital rules and began experiments of his own. “By 1895,” continued Dr. Couney, “I developed an idea for a machine and I left Paris for Berlin where I went to the laboratories of the famous Muencke brothers. I talked to them exhaustively and they made their own sketches of what I outlined. They made a preliminary model for me and once again I was confronted with the bugaboo heat problem. “I had to get a metallic combination for the regulation of my heating apparatus which would expand or contract according to the degree of heat. I concocted a silver and copper combination which worked to within ten degrees. My incubator body was made of sheet metal and I used hot water for heat. But, alas, the water syphoned out. Thereupon I decided on a double-walled boiler, getting the water to circulate instead of expanding and shooting out. To this arrangement I added an exhaust pipe—and all was safe. 4’Although I have greatly improved my heating outfit by means of the Bunsen burner, this primitive arrangement prevailed for many years. Today all my piping is of hand-hammered copper. “My greatest trouble at first was with the air, I had to guard the babies against pneumonia and bronchitis. Here I experienced all sorts of hardships. I extended a tube from the incubator through an aperture in a window directly behind it, using a cotton filter. I spent most of my time shifting the individual air-tubes to catch the air. It is after they attain the normal weight of six pounds that they are released from the Incubator Institute, and most of them go back to nursing mothers. Some of them have weighed as low as twenty ounces on entering the incubator. And now the poor mechanical mother just sits gathering dust in a corner wondering why no one ever calls. Anyway I know displaying the babies may seem weird but if it helped defray the costs for parents who couldn’t afford it why not?